The Tour De France (or Le Tour) is the world's most pre-eminent cycling race and one of the world's largest sporting events. Each year, it attracts the world's best cyclists, who spend a gruelling three weeks pedalling their way through rolling French countryside and towering mountains. All in pursuit of the Yellow Jersey. Along the way, fans flock to cheer on their favourites and the hundreds of kilometres travelled each day are lined with enthusiastic followers just waiting for a glimpse as the riders race by. It is usually held from the first Saturday in July and ends 22 days later at the Champs-Élysées in Paris. 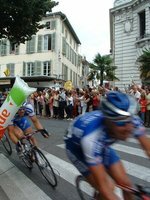 Tour de France website (English, French, German, Spanish). This is version 8. Last edited at 9:51 on Jan 18, 17 by Utrecht. 17 articles link to this page.